Samsung had started Galaxy Beta Program, which allows you to opt for latest Android Nougat 7.0 Beta software updates on your Galaxy S7 or Edge. This Beta Program is only available in selected European countries, which is also based on approval from Samsung. You will need to have an active Samsung Account and you must install Galaxy Beta Program App from Galaxy Apps which is available by default on your Samsung Galaxy S7 or Galaxy S7 Edge smartphone. 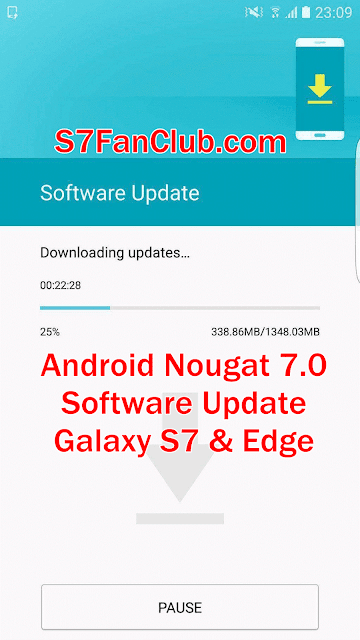 Great news: Official Android Nougat 7.0 Firmware is now available for download for Samsung Galaxy S7 / Edge. That will officially allow you to have access to latest Android Nougat 7.0 beta firmware on your Samsung Galaxy S7 or Galaxy S7 Edge. This means that Samsung is very soon going to launch the official Stock ROM based on Android Nougat for Galaxy S7 & Galaxy S7 Edge, which will be stable. Choimobile has recently leaked the OTA update based Android Nougat 7.0 Beta Firmware for Samsung Galaxy S7 and Galaxy S7 Edge. It is available for Download. But you are recommended to try it at your own risk, since the firmware is not yet stable, and might have bugs in it. It is wise to wait for official Android Nougat Firmware Update for your Samsung Galaxy S7 & Edge. In case you are interested to download and flash this beta / non-stable Android Nougat ROM, please make sure to backup your important data from your device, such as Contacts, Messages, Gallery. First download Android Nougat Firmware from the links below and here’s How To Flash Android Nougat Firmware on Galaxy S7 & Edge.